Note: The following is a transcript of a speech given by Bert N. Wheeler in Duluth on November 23, 1923, before the Old Settlers Society of the Head of the Lakes. Let me show you an eight-dollar Continental bill, #44626, dated 1775. This bill was the property of Great-Grandfather Thomas Holberton, who patriotically exchanged $54.00 in gold for $54.00 in paper money to help the American Army in its attempt to invade Canada. With this bill is a letter signed by Thomas Holberton, dated 1775 and endorsed July 4, 1820, reciting the fact that three similar $8.00 bills had been exchanged sometime previous to 1820 with Samuel Gable, a tavern keeper for 4 mugs of flip at $8.00 each. The bill and the letter are exhibited merely to show that the Wheeler family has an ancestral tree extending back into Colonial days. The ancestry of the Henry W. Wheeler family on this side of the Atlantic really goes back to 1635 when Thomas Wheeler of Bedfordshire, England, settled at Fairfield, Conn. The line of descent is as follows: John Wheeler, son of Thomas, father of 14 children and owner of 1000 acres of land, the richest man in the county; then his son, Lieut. John Wheeler, father of 12 children, who lived to be 92 years old; then Ichobod Wheeler, the Shipbuilder of Blackrock, Conn. and trader in the West Indies; and then his son John, my father’s father, who was born in 1765 and carried a musket in the Conn. home Guards in 1781 under orders of General George Washington. This John Wheeler, after working in his father’s shipyard, went west with his family and settled in Oneida County, New York, where Henry Wakeman Wheeler was born, March 19, 1821, being the youngest of 10 children and red-headed besides. The family then moved west to a farm near Grass Lake, Mich. in 1840. Grandfather John Wheeler was a devout Congregationalist serving as a deacon in both New York and Michigan. He had three children by his first wife and married Catherine Holberton for his second wife, who became the mother of the subject of this sketch. After helping his father get started on a new farm in Michigan, Henry W. Wheeler started out at the early age of 20 to seek his fortune. With all of his possessions in a pack on his back, he walked to Chicago and thence across Northern Illinois to Galena, which, at that time, rivaled Chicago as a commercial center, at a distance away of nearly 400 miles. This occurred in 1841. In the meantime, Sarah Caroline Brewster, direct descendant of William ‘Elder’ Brewster of Mayflower fame, came west from Broome County, New York, with her father James Brewster, a painter by trade, who located at Byron, Illinois in 1841, and then came on to New Diggings, Wisconsin, about the same time that Henry W. Wheeler arrived from Galena. 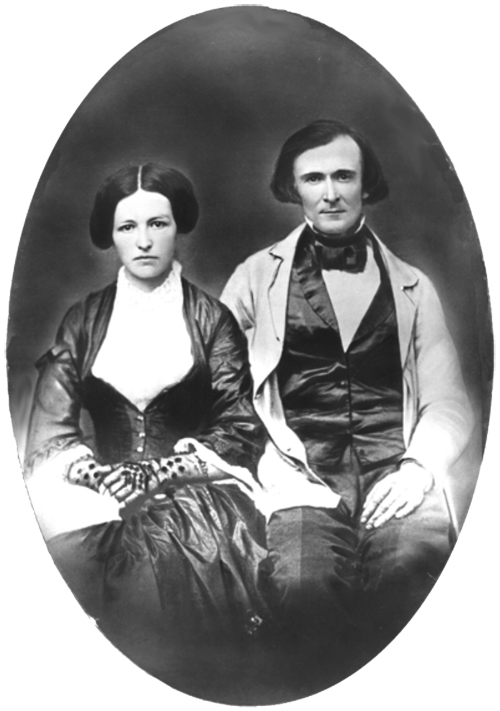 After a short courtship, these young New Yorkers married Nov. 25, 1847, at New Diggings. Mother was 19 years old and Father 26. They celebrated their Golden Wedding on Nov. 25, 1897 at their home in Duluth, Minnesota. From New Diggings, the Wheelers went to Neenah, Wisconsin on Oshkosh Lake, where Henry W. Wheeler followed the trade of a carpenter, building a number of dwellings and then became interested in a steamboat. His ventures were not successful financially, and he then went to St. Paul, Minnesota, arriving July 4, 1852 on the steamer Ben Campbell from Galena, Illinois, and took a position as an engineer on a Mississippi River steamboat between St. Anthony Falls (Minneapolis) and Sauk Rapids, named The Governor Ramsay. When this boat stopped running on account of ice, he became engineer in a saw mill, where he was at work when Mr. Edmund F. Ely, former missionary to the Chippewa Indians, found him and made him a proposition to come to Duluth to build and operate a saw mill and lay out a townsite on the North Shore of Lake Superior. In April of 1855 he started north, again with a pack walking from St. Paul to Superior. His wife came the following November, taking a journey of nearly six weeks with her three small children, the youngest only 1 year old. She had to go down the Mississippi River nearly to Galena, then across Wisconsin in a stage, then north by boat on Lake Michigan, then by stage (I think) across the land at the Soo, then by boat to Madeline Island and the rest of the way in a Mackinaw sailboat, arriving at Superior in Nov. 1855. That was a journey to try the heart of even a pioneer woman. When the machinery for the mill arrived, it was necessary to get stone for the foundations for the engine and boiler. This was done by quarrying sandstone at Fond du Lack, just above the present auto bridge, and bringing it down the ever-useful Mackinaw boat. One man was drowned in this operation. Two Frenchmen named Octab and Eusib were placing the stone in the boat. The current was rapid, as the river was high, and the boat, loosening her moorings, swung out into the river. The oars were ashore and the two men, who became panic-stricken, jumped into the river, but as neither could swim, one was rescued but one was drowned. The boat then drifted into an eddy and was easily secured when it came back to its starting point. Alfred and Lon Merritt held the reputation of being the swiftest men on a cross-cut saw in the North woods. They worked at this mill. About this time the Wheelers built a log house, and later built a frame house on the same location—in fact, they took the logs out of the walls and sawed them into lumber, which was used in the frame dwelling. This frame house still stands at 4510 Michigan Street, and is one of the few remaining land marks of those early Oneota days. My father, like all these early pioneers, had a vision of a great city at the Head of the Lakes; a second Chicago must surely result from the superb location at the head of navigation; and he told me as early as 1886 that I would live to see Duluth a deep-water ocean port. He also saw the need for a college in Duluth. The recent agitation for higher educational facilities calls to mind that Henry W. Wheeler, in the 1880s, gave 15 acres of land to the Duluth Collegiate Institute for the beginnings of a college under the auspices of the Presbyterian Church. But like all pioneers, he was a doer as well as a dreamer. Compelled to look after themselves, these hardy folks of pioneer days got along without a doctor or druggist, for none were nearer than Superior. They assisted each other in times of sickness and nursed whole families through scarlet fever epidemics. My mother or Grandma Merritt presided at the birth of nearly every child born in Oneota during those strenuous days. My father, with his jackknife, picked pieces of bone out of the hand of the man who had been injured on the circular saw; and he whittled cedar splints with which to bind up the broken arm of his granddaughter (Ruth Merritt) after he had reduced the fracture. They used blue moss, iodine, mustard, Ayor’s Cherry Pictorel and Quinine in liberal quantities and got well either because of or in spite of the medicine taken. My mother, with four or five small children, fed the mill hands, giving them breakfast in time to start work at 6:00 am. She did her own washing, baking, cooking and sewing without any of the modern conveniences. The Pioneers were doers. The above statement needs no proof, but let me cite the following facts to get them into the record. Mitchell Houle was, at one time, Sheriff of St. Louis County. In the course of his duty, it became necessary to levy an attachment on a raft of logs. He took with him Mr. E. G. Swanstrom, Henry W. Wheeler and several others. The raft was tied to the shore the Wisconsin side. The Sheriff’s party approached the raft with the sailboat, and at once got out upon the logs with pile poles, intending to push the raft out into deep water. The owner was concealed in some bushes on shore and he opened fire with his rifle. The first bullet whined overhead, the second whistled close by and the third struck the pike pole that my father held in his hand. He turned to the boat to get a gun that he might go ashore “and clean out the rascal” but the Sheriff thought that human lives were more important than logs and sailed away, leaving the owner in possession of the raft. In the construction of the breakwater at Superior, it was necessary to haul rock on scows and dump these rocks into the cribs to sink them into place. My father had a contract and used the tug Amethyst and scows to haul this rock. One day they were caught in a Northeaster and rather heavy seas were running on the lake so that the scow, laden with rock, careened over so far that the load of rock slid into the lake. it took with it two men who were suddenly thrown into the cold waters of Lake Superior. The Captain, Martyn Wheeler, at once threw off the tow line and turned the tug to reach the men before they sank. One of the men was a fine swimmer. Just as the tug passed him, my father, who was the engineer, reached over the rail of the tug and grasped him by the wrist but was unable to pull him aboard. The tug rolled heavily in the sea. When she rolled to starboard the man was lifted entirely clear of the water, while Father held him as he leaned over the rail, but when the tug rolled to port, the man’s head went under. There was no one else aboard the tug and the captain had his hands full keeping the tug from going into the breakers. After several waves had well nigh wrenched the man loose from Father’s grasp, Mart left the wheel long enough to come back, pull the man aboard and leave him in the engine room, then it was necessary to make a run for the scow, pick up the tow line and take her inside of the harbor before the other men who had remained on the scow were washed off. This was accomplished in spite of the breakers, but one man who went into the lake with the rock was never seen again.